If you or a family member is having a hard time ditching junk like classic Hostess plastic-wrapped cakes, try this homemade version instead! These “Oh Ohs” are still dessert all the way, but they don’t contain any partially hydrogenated vegetable oil, corn syrup, or artificial chemicals. 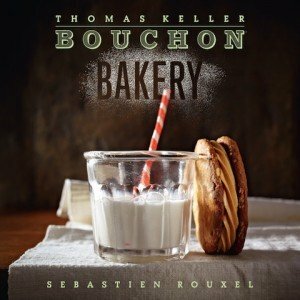 This recipe is part of a comprehensive collection of awesome dessert recipes found in Thomas Keller’s Bouchon Bakery cookbook. Of course, you can also skip the work by popping into Bouchon Bakery locations in NYC, California, and Las Vegas. 1. Preheat the oven to 350° F. Line a sheet pan with a Silpat or spray the pan lightly with nonstick spray, line with parchment paper, and spray the parchment. 2. Place the all-purpose flour in a large bowl. Sift in the almond flour; break up any lumps remaining in the sieve and add them to the bowl. Sift in the cocoa powder and whisk to combine. 3. Place the eggs, yolks and the 1/2 cup plus 1 tablespoon sugar in the bowl of a stand mixer fitted with the whisk attachment and mix on medium-low speed for about 1 minute to combine. Increase the speed to medium and whip for about 5 minutes, until the mixture is thick and pale yellow. Scrape down the sides and bottom of the bowl, then whip on medium-high speed for another 5 minutes, or until the mixture has thickened. When the whisk is lifted, the mixture should form a slowly dissolving ribbon. Remove the bowl from the mixer stand. 4. Whip the whites in a clean mixer bowl with the clean whisk attachment on medium speed for about 45 seconds, until foamy. Lower the speed and slowly add the remaining 1 tablespoon plus 21/2 teaspoons sugar, then increase the speed to medium-high and whip for 2 to 21/2 minutes, until the whites are glossy with soft peaks. 5. Fold the dry ingredients into the yolk mixture in 2 additions, then do the same with the egg whites. Pour the batter into the prepared pan and, using an offset spatula, spread it in an even layer, making sure that it reaches into the corners. Bake for about 15 minutes, until a skewer inserted in the center comes out clean and the cake springs back when you touch it lightly. Set on a cooling rack and cool completely. 6. Lay a piece of parchment paper on the back of a sheet pan. Run a knife around the edges to loosen the cake and invert it onto the parchment. Remove the Silpat or parchment from the top of the cake. Wrapped in a few layers of plastic wrap, the biscuit can be kept at room temperature for up to 4 hours, refrigerated for up to 3 days or frozen for up to 2 weeks. 1. Place a piece of parchment paper the size of the sheet pan on a cutting board and set the chocolate biscuit on the paper. Trim the edges to straighten them. Turn the biscuit so that a short end is facing you. 2. To make the filling, place the cream and powdered sugar in the bowl of a stand mixer fitted with the whisk attachment. Scrape the seeds from the vanilla bean and add them to the cream. Whisk at medium speed until the cream holds a shape when you lift it on the whisk and, if you will be piping it, is just stiff enough to be piped through a pastry bag; do not overwhip. It is best to spread or pipe the cream immediately after whipping. 3. Spread the whipped cream in a thin, even layer over the cake, leaving a ¼-inch border all around. Using the parchment paper to help you, lift the short end nearest you and fold about 1/2 inch of the cake over, just enough to begin rolling it, then continue to lift up the paper to roll the cake into as tight a roll as possible, stopping when you reach the center of the cake. Repeat, rolling from the opposite side, until the rolls meet in the center. 3. Cut the rolls apart. Cut two 12-by-8-inch pieces of parchment paper. Place a roll lengthwise along the edge of a paper and roll it up in the paper, pulling back on the roll from time to time to tighten it, using your hands, a paint shield, or a straightedge. Tape the paper in the center and at the ends, and repeat with the remaining roll. Freeze the rolls overnight. 4. Before you enrobe the rolls in chocolate, trim the ends off the rolls, then cut each one into 4 pieces. You want to dip them while they are still frozen. 5. Lay a Silpat on the work surface. Heat the pâte à glacer until it is hot; then strain through a fine strainer into a small, deep bowl just large enough to hold an Oh Oh. (Or prepare the ganache by melting the chocolate on the stove and stirring in the ganache until thick and glossy, and transfer to a deep bowl.) Dip one piece at a time into the hot chocolate (preferably wearing latex gloves), making sure to cover the sides as well, then remove, letting the excess chocolate drip back into the bowl, and place on the Silpat. 6. Let the glaze begin to set. Should any chocolate pool and harden around the base of the Oh Ohs, it can be trimmed away with a hot paring knife. Transfer to the fridge, and store refrigerated in a covered container for up to 3 days. 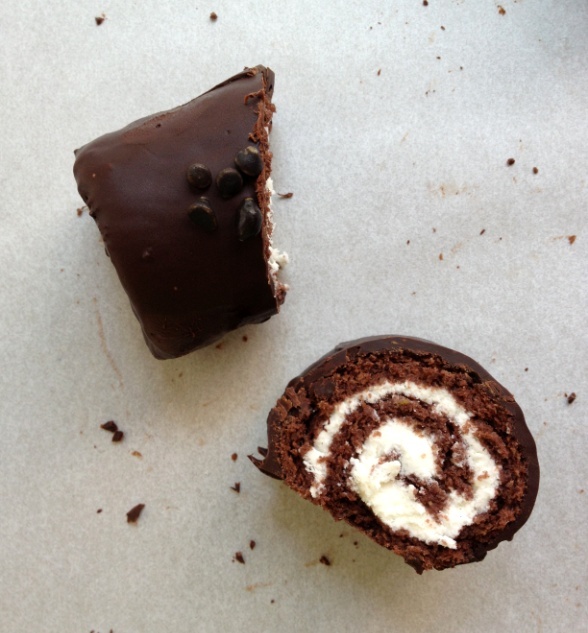 What did you think of this homemade Ho Hos recipe? Have anything else to share? Let me know in the comments below! 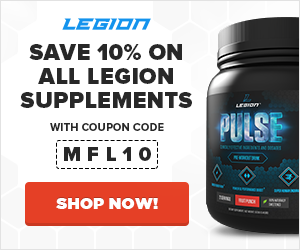 Muscle for Life Success: Josiah C.